At Retz & Aldover LLP in Palos Verdes, California, we believe in being proactive. In any case we handle, from real estate transactions and disputes to business formations and contracts, our attorneys use forward-thinking strategies to protect clients in their current situations and far into the future. Our law firm has a reputation for excellence in both the successes we have and the path we travel to get there. One of our founding partners, Kirk J. Retz, spent 10 years in the construction industry, which gives him invaluable experience that carries into his practice today. Our other founding partner, Ernesto F. Aldover, has handled more than $100 million in Housing and Urban Development loan transactions. Together, they form a powerful team with the skills and knowledge necessary to navigate any legal setting. We are comfortable navigating arbitration and litigation on behalf of our clients. Retz & Aldover LLP takes cases in Marina del Rey, South Bay, Los Angeles, Long Beach, Torrance, Hermosa Beach, Manhattan Beach, El Segundo, Redondo Beach and Santa Monica, as well as throughout Orange County. 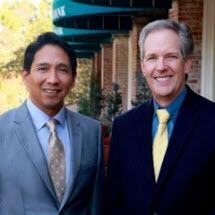 Our law firm offers free initial consultations.